FIGURE 2: Assays to detect chromatid recombination. (A) Genetic assay of sister chromatid recombination (SCR). (B) Molecular assay of sister chromatid recombination (SCR). (C) Cartoon of the direct repeated leu2 genes with the URA3 gene inserted in between, with the black vertical line indicating the leu2 mutations. 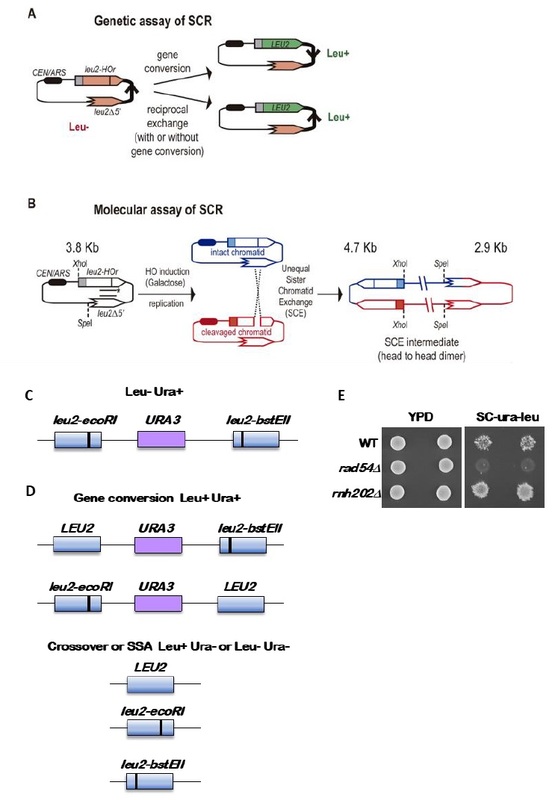 The entire reporter is integrated at the LEU2 locus and strains with the reporter have a Leu- Ura+ phenotype. (D) Recombination outcomes. Gene conversions are Leu+ Ura+ and retain the duplication, with one copy of the LEU2 gene now being wild type. Loss of the URA3 gene by a crossover or single strand annealing (SSA) yields Ura- segregants that can be Leu+ or Leu-. (E) Examples of Leu+ Ura+ papillae from three strains, wild type, rad54, which has very low gene conversion recombination rate, and rnh202, which has an increased gene conversion rate.